J. David Markham Napoleonic History - Welcome to Napoleonic History! 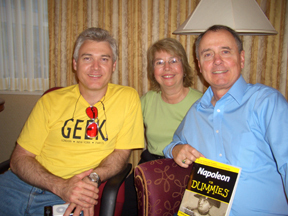 Cameron Reilly, Barbara and David Markham after producing a Napoleon 101 Podcast in San Francisco. Click here to go to the podcast. On the Biography Show, David and Cameron talk about the great people in history, from ancient times to the present day. Click here to go to the podcast. 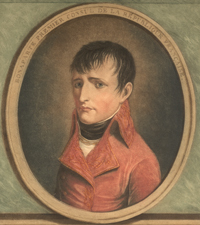 Click here to hear my podcast on Napoleon and the Unification of Europe that I recorded for my Napoleon for Dummies entry on the Wiley website. Napoleon Bonaparte’s career has been virtually unmatched in history. Only Alexander the Great and Julius Caesar may lay claim to comparable lives and influence on history. Many historians have dedicated their careers to the study of Napoleonic History, and I am proud to have joined their ranks. Over the years I’ve written books and articles, collected Napoleonic art, participated in television documentaries and, most recently, produced Napoleonic podcasts. The purpose of this website is to share my work with you, to give you a little background on my own career, and to help you find additional resources. I’ll also try to keep you abreast of Napoleonic events during this period of the Napoleonic Bicentennial, so please come back often for updates. I am available to give lectures to your conference or group. In the past I’ve spoken to groups of retired military officers, museum groups, retirement communities and, of course, academic conferences throughout the world. I can lecture on almost any Napoleonic topic as well as Alexander the Great, Julius Caesar and other topics. Many of my lectures are enriched with PowerPoint graphics from my collection. If you are interested in having me talk to your group, please send me an email with the particulars. My collection of Napoleonic art, known as The David Markham Collection, contains hundreds of excellent images, many of them virtually unique. I use them in my books and on this site, and some of the items have been featured in museum exhibitions. I am pleased to make images from my collection available for use in other books and publications. If you are interested in further information, please contact me through one of the email links on this site. 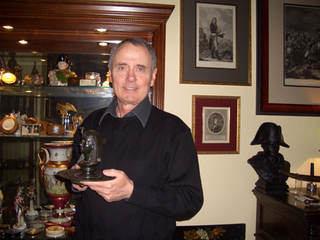 David with an Egyptian Revival inkwell and other items from his collection. This home page is the heart of my site. To the right is a list of my works. Please scroll down to see my books, encyclopedias and DVD/VHS programs. Click on any of these to go to their individual listing. There, you can click on the images to go to their listing on Amazon.com. You can also find them listed in the My Works page that gives mini-summaries of each work. Further down, you will see a link to my email and a few basic links to important Napoleonic sites, as well as to the Author’s Guild, host of this site. If you are a writer, I strongly encourage you to join this outstanding organization. To the left you’ll also find links to my podcasts. I am especially proud of my Napoleon 101 podcast with Cameron Reilly. We have covered Napoleon’s entire career and legacy. We do this podcast in a conversational style, which many of our listeners say they really appreciate. I’m happy to tell you that this podcast has become one of the most popular in Australia (Cameron’s home base), and has listeners throughout the world. We are now over 50 episodes, have an iTunes rating of 4.5/5 stars, and have received many great reviews. Cameron and I also did a few episodes of the Biography Show. We used the same conversational style to discuss the lives of important people throughout history. 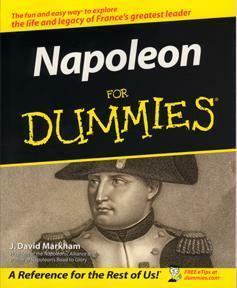 You will also find the link to my podcast for the Napoleon for Dummies site at Wiley Publishers. In the podcast I discuss Napoleon’s role in European unification. Our Napoleon 101 podcast was mentioned in the 3/16/2007 issue of USA Today. Click here to read the on-line version of the article. Jim Mowatt runs an excellent history podcast site (www.historyzine.com) and he wrote an excellent review of our Napoleon 101 Podcast. Below these comments you’ll find everything you wanted to know but were afraid to ask about yours truly. As time goes on, I’ll add more features to this site, so please come back often. I hope you find this website useful. If you have any suggestions or questions, please don’t hesitate to contact me. J. David Markham is an internationally acclaimed historian, Napoleonic scholar and award-winning author. 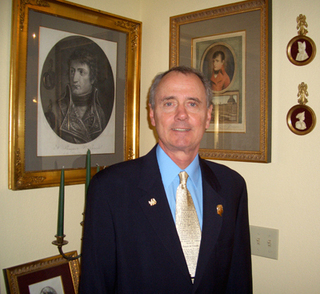 For over twenty years he has written and lectured about Napoleon and other historical topics. His other interests include Alexander the Great, Julius Caesar/Ancient Rome, and the French Revolution. He and his wife, Barbara, live in Olympia, Washington, USA. David has taught history and other subjects at the university, college and high school levels, and has received numerous teaching awards and recognitions. 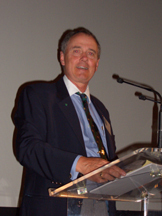 David is President of the International Napoleonic Society, having served as Executive Vice-President and Editor-in-Chief from 1996 until 2008. He has produced a series of International Napoleonic Congresses in Europe, the Middle East and Asia and edited two editions of the journal, Napoleonic Scholarship. David served as President of the Napoleonic Alliance from 2004-2007, and as Executive Vice-President for some years before his terms as president. A collector of some note, he has one of the world’s finest private collections of Napoleonic snuffboxes, as well as a significant collection of miniatures and engravings. All of the images used in his books come from his collection. In 2014 I was made a Knight of the French Academic Palmes (Chevalier dans l'Ordre des Palmes Académiques). 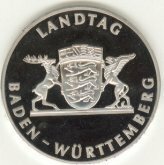 This is France's oldest and highest non-military decoration and is awarded by the Minister of Education and the Prime Minister. 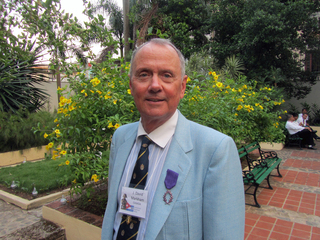 The investiture ceremony took place in Havana on 7 July 2014 at a reception at the home of His Excellency Jean Mendelson, French Ambassador to Cuba, who made the presentation. In attendance were participants in the 12th International Napoleonic Society Congress as well as ambassadors from the European Union, Germany and the Netherlands. 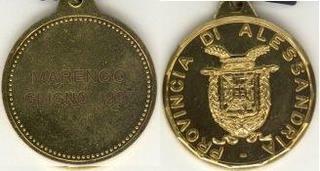 In 2009 I had the great honor of being awarded the Médaille d’or du Rayonnement Culturel (Gold Medal for Cultural Radiance), by La Renaissance française (an international French cultural organization with the high patronage of the French President and the ministries of Foreign Affairs, Interior, Defense and National Education). 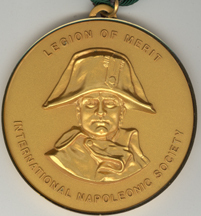 The Legion of Merit is the highest award given by the International Napoleonic Society, and recognizes special contributions to the field of Napoleonic studies. I was honored to receive this award in 1996. Outstanding Social Studies Teacher of the Year for Lake Worth Community High School, 1999, 1996, 1995. 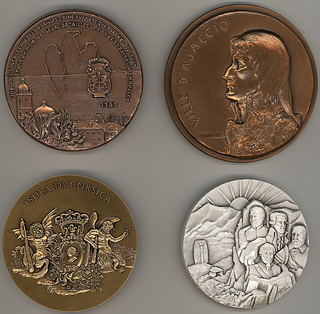 Medal of the City of Ajaccio (top);Medal of the Territorial Collective of Corsica (bottom left); Medal of the General Council of Southern Corsica (bottom right). History Channel International Global View (23 December 2005). Another version of the earlier show of the same name. History Channel Conquerors segments on Napoleon (19 June 2005) and Julius Caesar (June 26, 2005). One of several featured scholars and the only scholar in the 12-segment series featured on two programs. Served as historical consultant for both shows. History Channel International Global View program on Napoleon (28 April 2005). One of three scholars. National Geographic Society television/DVD program on Alexander the Great (November, 2004). Served as historical consultant and provided images of Alexander, Napoleon, Julius and Augustus Caesar for use in the film. The History Channel six part series on Napoleon (UK, 2001), now available on DVD as Napoleon: The Myths, the Battles, the Legend. Markham was the only American scholar featured. The show is now routinely shown in the US on the History Channel. The Learning Channel program The Napoleon Murder Mystery. One of several scholars featured, including INS President Ben Weider, on the one-hour program on the death of Napoleon that aired on 16 August 1999. Discovery Channel program Breakout. One of two historians in a segment on a prisoner of war escape from Verdun during the Napoleonic period. The program aired 9 and 15 February 1998. Napoleon on the Nile: Soldiers, Artists, and the Rediscovery of Egypt (Frye Art Museum, Seattle, WA,8/2008–1/2009). Several important items from my collection were part of the exhibition and I did a number of programs for them during the exhibition. Napoleon on the Nile: Soldiers, Artists, and the Rediscovery of Egypt. Dahesh Museum of Art, Manhattan, NY, 8 June – 31 December 2006. Four snuffboxes loaned to the exhibition. Napoleon the Great: Selections from the David Markham Collection (Phoenix Art Museum, 11/1989–3/1990). Revolution in Print: France, 1789 (Phoenix Public Library, July–August, 1989). A portion of The David Markham Collection displayed as part of the Bibliotèque Nationale de Paris traveling exhibition.